Life is all about the choices we make. Sometimes, those choices are small. Left or right? Paper or plastic? Red or white? Sometimes, the choice can change your life. Lacing up a pair of shoes and choosing to finish a marathon falls into that category. We travel a lot for races and sometimes two races fall on the same weekend or the same day, like this year when the Rock n Roll series added a new race in Chengdu the same weekend as Los Angeles. That creates a choice that’s full with opportunity. Getting to Chengdu was a 14 hour non-stop flight from San Francisco. We met Jeff and Maggie as we waited to board and also Paul and James, connections from the Marathon Maniacs page. I can’t thank Sherry enough for using one of her United Global Pass upgrades to get me set up with seats in business class. Susan was in 1B, Sherry and I were in 4A and 4B. The flight attendant was a little confused that she saw two Carinos not sitting together (‘WHAT?! My WIFE is on this plane too!?’). A few movies naps and meals later, we were landing after sunset halfway around the world. The time change actually wasn’t too bad. We arranged a car for 3 with Travel China Guide for about $100 for the hour-long drive. Right away, you got a good taste of why first timers really shouldn’t drive in China. Lane lines are suggestions and the electric moped and pedestrians were absolutely fearless at intersections. I was amazed we never saw an accident the entire time we were there. We slept a good 7 hours and woke up in time for breakfast at the Uvila Resort and Culture in Dujiagyan (found through Agoda.com – some pics of our room below). It’s a higher end hotel by any standard with pricing in the $150/night range. The key criteria for us was the location, a 10 minute walk from the start and finish lines. The sponsored race hotels were located in Chengdu, 40 miles south and train and car round trip can easily eat up cash and free time. Packet pick up was at the Dujiangyan Sports Complex, about 5K from the hotel down the main streets of the city. The guide books said that the Chinese aren’t shy about staring and apparently, we were quite the sight. They were very polite though the language barrier was pretty high. I recommend getting an international data plan with VPN, Google Translate and WeChat (in that order). The locals did a good job with their own phones, too. Everyone was very friendly. The route to the stadium crossed a few bridges, some great photo-ops and more crazy driving episodes. We ran into Andrea at the Sports Complex and had a few photo ops with the CGI rep who traveled to watch over the inaugural event. Aaron, Andrea and Sherry were 3 of the 4 who’ve run the table on RNR events so far (Leon was the fourth). All of them were taking on the challenge to finish the half in Chengdu, get back to the airport and fly to LA for the half in the states the next morning. The dateline would help them as long as they caught all flights and they were reasonably on time. Stacey and Chip from RNR were going to let them start with the full marathon start, giving them a few extra hours. We weren’t sure if there would be any problems if the half marathon bibs crossed the finish line early. That might be hard to explain if you didn’t speak the language. Susan went back to the hotel to get off her feet and Sherry, Aaron and I did a little exploring, trying to find the best route to the starting line for the noon start. We did a bit of climbing and found a Wal-Mart to get some race supplies. Let’s just say the selection was a bit different from what we’re used to at home. We dropped off our supplies at the hotel and found a back way to the starting area. The stage was as big as any of the US races and they were doing sound checks that we could hear from the hotel on the other side of the hill. We had dinner at the hotel. Night races always make for a difficult fueling schedule, but the pasta was pretty good. Yes, that’s a pineapple pizza. The noon start actually worked really well since it gave us an extra night to get fully rested. I woke up around 7, went down to grab a light breakfast and started prepping for what looked like a warm rainy day until just after noon. The race bag included disposable ponchos. Win! Pro Tip: Bring your own toilet paper. This double is about to get real. The starting area was just what you’d expect at a big Rock n Roll Marathon. Security was tight, but once inside the zone, it was a well-organized with a party atmosphere and plenty of space for people to warm up. We met a handful of Marathon Maniacs at the start including John, who’s done every Inaugural RNR Marathon. The first mile took us through the cobblestone streets of the city to the west side of the Minjiang River over the irrigation system that was constructed in 250 B.C. And it still works! This was an out and back with the half turn at the Panda Preserve. I was able to catch Sherry before the turn and saw Aaron, Andrea and Leon on the way back. It was a really good day for a marathon. The mist was keeping us cool and there were a few mile long stretches of frontage road that were lined with trees. At the accessible points, the locals were out in force. We noticed one cheer in particular repeated all the way along – “Jai You!”. When we did the Rome Marathon in 2008, the locals would cheer “Die! Die!” (I think that translated to “keep going”, not the English meaning”). I figured at some point, I’d have to figure out what Jai You meant. Miles 11.5 – 13.5 were a 3% uphill grade to the turnaround at the Qingchengshan Temple. I was on about 5:10 marathon pace, but could feel the incline taking its toll. This sign couldn’t come soon enough. I’d been following the fellow in the green shirt for about 5 miles. He asked me if I was a professional race walker. Yeah, I wish. Cramps started on the turn downhill. So much for the PR, but I was still in good shape for a 5:30 finish. I saw Susan coming up on the hill about 5 minutes later. The lady in the orange just ahead of her was a story I’d hear about later. At about 30K, a local named Soon Ri (I’ll edit the spelling when I see the Chengdu results post), pulled in beside me. He spoke just enough English to hold a basic conversation and told me this was his first marathon. His target time was 5:30 and he was having trouble with his pacing, so we started clicking off the KM’s together. He’d never been outside of China but eventually wanted to visit the states. I told him I was enjoying China much more than I was expecting. Running connected us even through the language barrier. He was the one who told me that Jai You translated into “Keep Fighting”. Google’s version – ‘add oil’ – was in the spirit, but not nearly as motivating. The thing I love about out and back courses is that you know the route and what to expect after the turn. You can save something for hills and keep focus mentally when you get back to the long stretches of monotony. Making the last turns over the dams meant we were within sight of the finish line. The stairs going into the South Bridge at KM 41 so pretty on the way out, but the dozen or so steps on the way in were good for a wince or two. Soon Ri had friends waiting for him on the other side of the bridge, snapping pictures as we went through the markets and on to the finish line. This was a sweet moment for him. I was happy to be there to share it. We came close to our target time, but its his new PR. Susan finished about 10 minutes later, hand in hand with the lady I saw her with at the turn. Her new friend didn’t speak a word of English, but through hand gestures, they fell into the same run/walk interval and made sure each other were staying hydrated and motivated. They were together for 20 miles. Both of us finished will within the 6:30 cutoff time with enough extra to take a lot of pictures. At the finish festival, Jeff reminded us we needed to pick up our World Rocker medal for completing a race outside the US. When we signed up for the race back in June, it was the last continent we needed to visit for full marathons. Some of the running clubs are recognizing the new Zealandia continent, but until that gets internationally sanctioned we plan to rest on our laurels and work on half marathons in new states for the next few years. That’s a choice we’re making now. It seems like we’ve made a number of good choices in our lives since we started racing. Rock n Roll Chengdu was the inaugural Rock n Roll event in Asia. It was announced in the last few months of the negotiations with the World Triathlon Corp, operators of the Ironman series. With numerous Ironman events already running in Asia, it’s probably just a matter of time that more Rock n Roll events are announced on the continent. The course starts in the parking lot of the Mingguan Ancestral Temple and finishes nearby at the Chongsong Ancestral Temple. After crossing three bridges in the first few miles, the course turned south on highway 59 and 4 past the Panda Preserve at mile 6.5 (the half marathon turn). The Qingchengshan Temple marked the turn at 13.4 miles. The scenery was a good mix of high density residential, country back road and tourist attractions. Susan says it her favorite full marathon course on the Rock n Roll circuit. I’d have to agree. While the results are still not posted to date, the estimated participation was in the 8,000 range for the full, half and 6K fun run. I hope it is back for 2018. If Chengdu is in your future plans, be sure to get your Visa application in early. Most US-based embassies will take about a week to process it. The San Francisco office required photocopies of your passport along with the application, passport photos and the ticket number for your flight (both legs). Take a world phone with you or activate T-Mobile unlimited or AT&T International Day Pass (I was told that taking a US phone and trying to install a local SIM card there doesn’t work unless you register with the local authorities). The data plan comes in handy for character recognition/translation apps and taxi cards. The locals really appreciate the effort. Aaron, Andrea, Leon, Sherry all made their flights and landed throughout the night before Rock n Roll Los Angeles. All four are on track to race in 25 locations in 2017 as all were in Savannah and Vegas and plan to race in San Antonio. It was great to watch the extra level of awesome in action. We spent 3 days in Dujiangyan and another 3 in Chengdu. We had enough time to see both Panda breeding facilities and the Giant Buddha statue in Leshan and walk around downtown Chengdu day and night. It was a wonderful way to finish our last continent. We’re rolling the odometer over. Just like Joe Harris did when he finished his 100th Rock n Roll race at DC in 2015, we’re starting to count over from One. Given that introduction, it makes more sense that we make some rookie mistakes. We landed Friday and had just enough time to get to the expo to pick up our bibs. Although we signed up for a Remix weekend, we wanted to spend more time with Jennifer, our maid of honor from our grad school days, and her husband Mike. We decided to pass on the Saturday 5K. Part of all the travel for races is being able to see friends we don’t get visit otherwise, so we had dinner and breakfast in Springfield, Illinois about an hour and a half from St. Louis. We weren’t totally slacking though. We found time for a 5K of our own on the Lost Bridge Trail. If you’re in town and need a place to train, it’s a good path and could probably support a half marathon distance without a lot of trouble. We had a light brunch and made our way back to St. Louis. Jennifer would join us later. Saturday we picked up Al and hit the expo. He and about 130 people had already finished a Rock n Roll that morning on the east coast for the first half of a double race weekend. Brooklyn had a 7 AM start. Most people caught a late afternoon flight to either St. Louis or Denver for the Sunday half marathon. Lisbon was the other option (on Sunday as well, but it couldn’t fit into a double). Logistics for BRK2STL and BRK2DEN were more eventful than some people might have liked. While Al and Tawni were able to catch an earlier flight out of New York, that airport was later shut down due to a bomb scare. It’s unclear if any of the RNR doubles were impacted. Also, some of the BRK2STL runners had a connection through Chicago but the continuing flight was either missed or cancelled. They had to rent a van and drive a few hundred miles, arriving in St. Louis Sunday on a few hours sleep. We miss all the fun it seems. Numbers for St. Louis were down again and there was no registration for 2018. This is never a good sign for the race, but we did manage to add to our collection of RNR swag. These could become collectors items. We had an early dinner at Gio’s so Drew could catch the Pixies concert. Tawni spent the weekend with Peanut (taking him to shop and see a few shows in the Big Apple). Tawni would also be doing her Gold Record (10th) RNR for the year and started narrowing down the location for her 50th state half marathon (Minnesota, May 2018).We caught up with Tricia and her last few weeks at the Berlin and Chicago marathons. Tricia also brought Peanut a friend – I think she settled on the name “Buttercup”. I love how there’s always something amazing to recap or look forward to when we get together. It was a beautiful night for a raid.. and a walk. Given the Sunday options, St. Louis ended up being the best weather as far as we were concerned. Lisbon was hot and Denver was freezing. We had mid-50’s temps, a little sprinkle at the start and the occasional blast of wind while waiting in the corrals. There was about a 25 minute delay at the start to secure the course, but with an extra space blanket and a disposable plastic poncho, it was nothing we couldn’t handle. There wasn’t really a group pace plan this weekend. We stayed together the whole race the week before in San Jose but with Chengdu and Double Live V coming up in a month, we were on our own. Al took off and I stayed with Drew and Elaine for the first mile before stopping to see how far Susan was behind us. She was taking it slow, still wearing the rain poncho, so I decided to see what I could do for the last 12.1. It ended up being my fastest race in probably 2 years. But you won’t see the split times on the results page. Why? Because on the bib, there are two halves of the timing D-tag. One has the instructions on how to put it on. The other is the timing chip. For some reason, I made the rookie mistake of using the wrong half. Susan, on the other hand, went the whole race in the poncho. At the end, she realized that her bib number was obscured. So while I went the whole race without timing splits, but had a lot of pictures. She got all of her split times, and except for lifting the poncho and flashing the finish line, almost no pictures. Pictures. Or it didn’t happen. Fortunately, we got them. Jennifer was waiting for us at the finish line with an adorable sign. It’s going to be with our race souvenirs when we get the new room outfitted with medal hangers and the San Jose memorabilia. We had a late afternoon flight out, so we had time to hit Park Avenue Coffee for gooey butter cake – seven flavors in all. So much for that pesky calorie deficit. As we sat, we flipped through Facebook posts from the crew in Denver. A few dozen of them stopped for beer during that half – twice – and ended up finishing together. The pictures and videos were absolutely awesome. We leave for the inaugural Rock n Roll Chengdu today. It’ll be our 14th Rock n Roll this year, somewhere around or 15th or 16th full, but most importantly, the last of 7 continents for full marathons. It’s been 12 years, 4 months and a few weeks, but this item will finally be checked off our bucket list. I can assure you, once we get the SIM card for China, there will be pictures. We had a little more confirmation after the race that both St. Louis and Brooklyn are not likely to be held in 2018. Denver is still on the schedule, but with Vancouver, Queratero and most recently Mexico City being off the tour stops for next year, that reduces the amount of races in North America. Getting to the Hall of Fame is going to require a little more planning to get to enough cities, maybe requiring a European trip. There’s some talk of another world major in the eastern hemisphere, possibly under the Rock n Roll brand. The Hall of Fame count for 2017 got a big bump this weekend. Congrats to America, Amy, Erika, Tony, Jen, Liz, Melinda, Noah, Leny and a few more that I didn’t recognize from the pictures in the Black Sheep Run group. The Pannell Report is probably going to be a little late because of all the data we need to crunch. With any luck, we’ll have something when we get back from China. Over the weekend, Susan and I finished our 100th Rock n Roll event, becoming the 8th and 9th people to reach that mark. Susan is only the second woman hit the century mark. I’ll never be able to capture all the moments and feelings we experienced over the weekend in a single blog, but there was something so magical about the weekend. Sometimes, a theme writes itself. We were joined by almost all of our closest friends and even had my family there for the first time. My brother Eric was impressed with everything he saw over the weekend. When he posted pictures, he referred to us as “Rock n Roll Royalty”. I immediately thought of the Chronicles of Narnia, a story where four young children walk into a mysterious wardrobe to find that it’s a gateway to a magical land. They become heroes – the Kings and Queens of Narnia. “We pass through the archway and out of our reality and we enter the land of Rock n Roll. We meet the herald who announced our latest journey. We thank him for the kind words. (Kevin Gemmell, writer for the article in Competitor Running Magazine). We are accompanied by our trusted companion, dressed in the armor which protects us from harm. Our shield is inscribed with the names of the warriors who go into battle with us daily. Thank you, Drew, for your selflessness, humor and optimism and letting us be there for your 100th half marathon last year. We greet the citizens of the magical land: The keeper of the keys to the dance. The woman with the voice of an angel. Thank you, Mindy and Ann! On the morning of the second day, we rode out to survey the roads of the kingdom into a glorious sunrise. We returned with many treasures. After the ride, the signs of a coronation appeared. We were ready to follow the kings and queens of other regions who came before us. We meet with the Queen of the Lone Star. We will be journeying with her to the far east before long. Sherry Ricker: First woman to 100 Rock n Roll’s, fourth overall and most RNR race medals including the mile, 5K and 10K. The King of Paradise came bearing intoxicating gifts from his island. Kamika Smith: Sixth to 100 Rock n Rolls. He brought us fresh leis from Kauai. Next came the Eternal King of the East. His grace and gentleness sets an example for us all. VIP Joe Harris: First to 100 and 146 RNR heavy medal events lifetime. Far and away the most ever. The King of the City of Light arrived next. Our thoughts are with his land as it is recovering from devastating events. Jeff Calene, Fifth to 100. His hometown of Las Vegas is still wondering why. We closed the faire with the warriors in our army. Those who have overcome great odds to participate in the battles and those who have more recently picked up shields to ride into the fray. We dined that night with the multi-talented King of the Harvests and Wizardry. He was instrumental in planning for the festivities for the weekend, for which we are eternally grateful. Al Hernandez (left): 3rd to 100 RNR’s. My mentor and best friend. As we dined, a great bird appeared and transform itself into a mirror portal with which we heard the greetings from the King of the City of Wind. His close friends are fast approaching coronations of their own. Greg Heilers (center): 7th to 100. Mitch Ginsburg (right), will be the 10th by the end of 2017. Amy Heveran (left) might even make it by 2019 at the torrid pace she is going. We were graced with the presence of Queens from other lands – accomplished in their own rights, and worldly enough for a seat at the table. Caryn (Left) will be running her 100th half marathon next year. For Tawni (Center), San Jose was her 150th half. We sought our beds early, excited for the events of the next day. Before the sun rose, we received an owl from our friends from the Kingdom of the Tar Heels. We were sad that they could not be with us, and our hearts overflowed upon hearing their voices. More Gypsy friends check in. Beth and Jim were with us when we started this quest in 2012. We were always thinking they would be the first married couple to 100. They’re not far behind us. We rode out into the chill morning air. Smiles shone like stars, much like the clothing we wore. Somehow, my real life family was drawn into this fantasy world. I was happy to have them along for the story. Mom and Dad join our race group selfie. Thanks to Jenny and Tamara for being there too! In the final minutes before the parade, the King of the West Palms arrived – his transport landing shortly before the clarion call. All was now complete for these brief hours in the land of Rock n Roll. Kevin (back, center) was second to 100. He has been roaming the globe chasing the world majors. It was with these friends and companions that we started this journey and with these kindred spirits that we took the final 13.1 mile ride. We are honored and humbled to be counted among them. This is the magic of the kingdom. Ordinary people who visit often can reap untold riches, wisdom, and happiness from the journey. Warriors can prove their mettle. Some come home victorious while others may leave the field to fight another day. In the end, with the energy of our friends and compatriots, we took the final steps to ascend to the thrones of the Valley of Silicon. It may only be a fairy tale, but while we are in the confines of the doorway, it is as real as flesh and blood. The journey is not for everyone, but all who are bold enough to cross through the arch are welcome in this land. We are the Kings and Queens of Rock and Roll. At the end of the first Narnia movie, the children step back through the wardrobe, into a train station in their own reality and get caught up in the every day lives of other people, oblivious to their alternate world. We drove home listening to news of the Las Vegas shooting investigation, instability in North Korea, recovery efforts in Puerto Rico and the next morning friends and coworkers were fleeing for their lives from the wildfires raging in northern California. It seems that in this crazy world, even for a brief moment, Rock n Roll can give you an escape like no other. Our deepest thanks to the countless number of runners, walkers, strollers, rollers, Team in Training, Biggest Losers, AACR, St. Jude heroes, Black Sheep, and Hogwarts Runners who we’ve met on the Rock n Roll circuit for the last 11 years. The stories we’ve heard, the things that we’ve seen, the lives that have touched us are memories that will forever be ingrained in our hearts. To the staff at the Rock n Roll Marathon Series, past and present, thank you for your tireless work. There have been early mornings, late nights, times when events went wrong, when nature dictated a different outcome, and when tragedy struck. Through it all, you’ve been professional, courteous and put on the bravest faces. For Ann, John B., Garrett, Tracy, Nista, Shayne, Josh, John V, Cassidy, Thao, Colleen, Dorcas, Darlene, Grace, Cathy, Lisa, Mindy, Ryan, Amy, Diva, Emily, Kristin, Yinka, Elisa, Ashley (x3), Petey, Victor and many more I know I’m forgetting, know that you have made the events a fixture in our lives that we can’t live without. To our dear friends in this story. Know that without your kindness, friendship, support and love, this journey would not have been as rewarding and fulfilling as it has been. And if and when one of us is unable to travel to as many races as we have been for the last few years, we look forward to flying to see you, just because. We look forward now, to the next 100. I have a fondness for Richard Bach books that dates way back to college. I find that when I reach a big milestone or turning point I end up pulling some quotes from his books. It seems appropriate to do it now. There are a lot of lessons we’ve learned from our time racing with our friends. Here are just a few. 1) Never be afraid to try something new. Also, upgrading to the latest tech feeds your inner geek. 2) Take care of your body, and it’ll take care of you. 5) Generosity is a virtue. As is humility and kindness. 6) Petting a dog makes most thing better (even the dog). 7) You can be small in stature, but have a giant’s will and courage inside. 8) It can be a great achievement in itself to make someone else happy. 9) There is always the right attire for every occasion, especially at national monuments. 10) Capture your memories. Don’t forget to post and tag. 11) Don’t throw away your shot. Thank you to all of our gypsy family who have made these last few years so memorable and to all the Black Sheep, Team in Training, Team Future, AACR, Biggest Loser, SportHooks, and CGI friends who’ve been with us every step of the way. We hope to share the journey to 100… and beyond! Our marathon training schedule said we should be doing 20 miles this weekend. But when we learned that Saturday, Sep. 23, 2017 was going to be Coach Alfonzo Jackson’s last coached training with Team in Training, we changed course and joined about 30 current and former TNTers to surprise him. Decades of participants, coaches, managers up at the crack of dawn to honor Coach Al. It takes a special reason for us to get up at 4:30 on a Saturday morning to be out the door by 5:45 and drive up to the Richmond Marina. Today was all about paying respect to an extraordinary individual who has shaped, inspired, and positively impacted so many lives. Coach Al’s legacy as the East Bay Run Coach for TNT may be coming to an end, but the impact that he has had on all of our lives will continue to live on. We caught up with long time TNT participants, mentors, captains, coaches, and a former team manager – near and dear to us. As we were reminiscing, we started to reflect on our first encounter with TNT. Ron and I were classic, “Off the couch recruits.” We showed up for our first TNT training in February of 2005 at Crissy Field in San Francisco. We were dressed from head to toe in cotton (including our socks! ), baggy sweatpants, hooded sweatshirts and carrying two 32 ounce bottles of water – for a 2-4 mile walk. Coach Tom didn’t say anything except that the Gear clinic would be held after the walk at Sports Basement. This is where we quickly learned that we were wearing ALL the wrong things. We walked out with a completely new wardrobe and Sports Basement quickly became our favorite store. We can’t leave there without spending several hundred dollars each time we shop. Former East Bay Run Coach, Gary, was an experienced runner before he joined TNT. Yet, he too has funny stories about what he wore back when he first joined TNT including short shorts. We hear they’re making a comeback so you may still have the chance to get in a few more miles with them! to give Al grief. Of course, Al responds, “I want to be like Nancy when I grow up!” We ALL want to be like Nancy when we grow up. Who else do you know who is in their 80’s and still racing nearly every weekend? She often wins her age group, even when she’s not the only one in her age group! woman’s life. What a way to go out Coach Al! People come and go in our lives. Each one has the potential to change us for the better. We are honored to have had the opportunity to share our TNT experience with one of the greatest, if not the greatest, coach of all time. Coach Al, we feel your love and want you to know how much you are loved in return. We’ve never had a real story. I mean, compared to other people, it’s hard for us to point out something we’ve done that is truly special. We haven’t overcome life-threatening illnesses, haven’t set any speed records and we know people who’ve done so many more races that we have. Sure, we’ve shown up to quite a few races in a lot of places, but we look around and continue to be in awe of people we meet. Rock n Roll Philadelphia always attracts world-class runners. 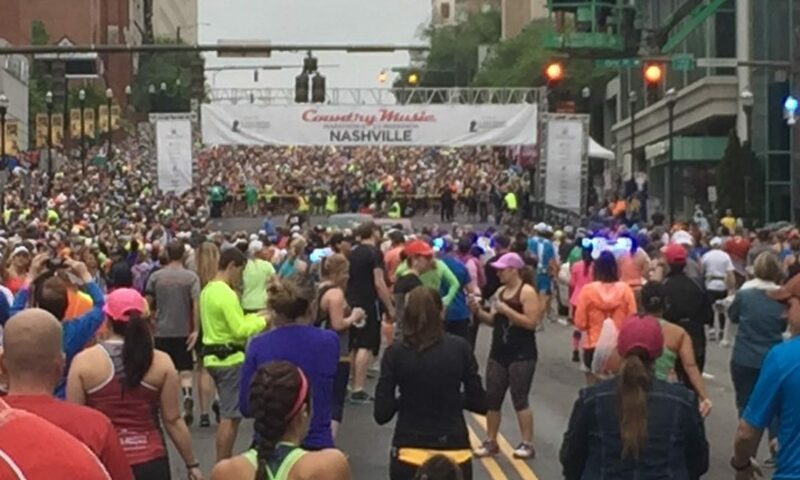 The fast course and usually friendly conditions mean there’s always a chance you could see a national or world record fall, like seeing Deena Kastor break the Master’s half marathon record a few years back. In 2017, the half marathon field included names like Olympians Galen Rupp and Jared Ward and Jordan Hasay. We were in for a treat on the roads, but Philly is also a great city to explore. There’s a lot for history buffs, museum enthusiasts and foodies alike. We landed Friday just before the Expo closed with enough time to drop our stuff at the Sheraton. Al took a later flight and we ended up on the same plane from Vegas. Peanut was off to her 9th race of the year. We may need to send her to Brooklyn or Savannah to pick up another race so she can get to the Hall of Fame. Heh. The medals were different denominations of currency. I heard “Show me the Benjamin’s” more than a few times. We had a little time to catch up with Rick and the CGI staff after a two month break. Diva had been riding across the country on a motorcycle. Amy now lives in New Jersey and will try to do the expos at Philly, Brooklyn and DC. After a quick bite at Rex Pizza, we headed out to stretch our legs after the long flight. It was going to be a warm race weekend, but it did make for pleasant evening weather. Pedicabs with lanterns giving loop tours of the mall. This was the first of a nine-weekend stretch featuring 11 different Rock n Roll race locations (8 of those locations logistically possible, maybe one more if you chartered a plane). This was the start of the push for Hall of Fame 2017. Anyone with 7 or more races had a good shot at 15. Now it’s all a matter of staying vertical and showing up. We’re pretty good at that last part. Good luck to Hyalker in his new gig in Denver. He was here with his siblings for the half. Rick was up early to cheer us on. It was a warm morning, but the route along the river was Juan-derful! Amy was a week away from her first world major, taking it easy on the 5K with her mom, Jamie. Truly an awesome family. We headed over to the Rocky Statue before the line formed. I even had enough energy to run (yeah, actually run) the steps of the museum. The view from the top is a treat. On the way out, we stopped by the stage to see the leaders finish the 10K and say hi to Ann. Someone said that 10K winner, Andrew Carnes, also ran the 5K. It wasn’t the case, but a number of the Black Sheep successfully did the double on Saturday. And on the way back, we finally find love. Post race lunch was at Reading Terminal Market. There are a lot of restaurants close by, but the variety here is awesome. Even the chocolate shop had some… interesting shapes. You can even get ice cream at Millers that matches your outfit. Pre-half dinner was at Maggiano’s with the AACR charity organization. We did this in 2016 and it was a great way to get some inspiration. Joe, Sherry and Leny were all raising money this year.Hundreds of AACR heroes raised close to have a million dollars for the weekend. We got a private performance from Boy Band, the ladies who were singing the national anthem on Sunday. Sherry and Tawni even walked away with a few of the raffle prizes. We actually hit two Raikou raids before headed to bed. We’re still trying to catch one for Tamara. Off to race number 11 for the year. We weren’t getting a Heavy Medal this weekend, but we do get a Remix medal and see our friends walk away with a lot of hardware. VIP was right next to the Washington statue, a perfect place to find our friends. TeamUp was representing well. Beth and Lisa were sporting the Allard braces. Without them, foot-drop makes it hard to walk and really hard to run. With the braces, they’re a force to be reckoned with. We got into the corrals early with plenty of time for selfies. I missed walking a sub-2:30 in San Diego. My Garmin actually had 2:29:59, but the website showed 2:30:00 and the official results ticked it up to 2:30:01. I thought about challenging it with my watch time, but after thinking it over, I didn’t earn it. Figured I’d have Philly and maybe St. Louis to try again. Drew and I paced for the first 8 or 9 miles, petting all the dogs on the way. It was creeping into the 70’s and it was muggy, but I was only 10-15 seconds off pace. The turn at the Falls Bridge at mile 9 put us into a slight downhill to mile 13 before a short uphill into the finish line. I just picked a few people who were pulling along at a good pace and tried to pick them off one by one. After the next 3 miles, I was able to put in a 50 second buffer, enough to climb the last slope and cross the finish chute to give Ann a high five with 10 seconds to spare. Cross off another year achieving an arbitrary milestone! The Heavy Medal tent was hopping. Ryan and Mindy were hip deep in Gold Records. Barefoot Henry continues his quest for his first Hall of Fame. Al, Josie and Zach are on track to repeat. Two more Hall of Fame headphones were awarded in Philly. Ainsley and Greg took the traditional shots from this slightly lower volume design. Leny picked up another. I stepped back to appreciate her back bib after learning how her home in Florida was impacted by the recent hurricane. The bib was for cancer. Twice. Now add Irma. While there were no speed records this weekend, there were some blazing times that most mortals would have been happy with. Susan continues to be on track for a marathon PR in Chengdu. Overall a good race day. Tamara didn’t get to Reading Market in time Saturday night, so we went back for lunch. Between the cheese steak, pulled pork, brisket and Bassett’s ice cream for dessert, it was worth the trip. We may still yet hit personal bests this year. We’re talking care of ourselves so maybe we’ll be fortunate enough to live long lives. Instead of raising money, we’re donating to our friends, at least for now. And while we have friends who’ve hit 100 Rock n Roll races already, we’ll be hitting that milestone in a few weeks at Rock n Roll San Jose. We’ll be the first married couple to both do it. Maybe there’s a story there after all. There’s still time to make a donation to the AACR for Rock n Roll Philadelphia for the Black Sheep Run team (includes a link to Zach’s page). You can also find direct links for Sherry, Joe and Leny. We turned right onto Michigan Avenue right about the 10K mark. My early estimate was that he’d be coming up to pass us between mile 6 and 9. Sure enough, not 100 meters past the turn, there was Greg, passing us on the right. He slowed down just enough that we could hand him our beer tickets. Rock n Roll Chicago 2017 was another milestone for the RNR loyalists. Greg Heilers became the 7th person to finish 100 Rock n Roll Heavy Medal events (101 if you count the 10K in Brooklyn, which he didn’t). He’s the third one to reach that mark in 2017. He’s been racing on the RNR circuit since 2008, and after ramping up to do 55 in the last three years, it was just a matter of time. I say that last sentence lightly, but it belies the magnitude of the work required to keep going that long. There’s the physical toll to doing 34 marathons and 66 half marathons and dozens of 5K’s and 10K’s – and that’s just in the Rock n Roll series. Then there’s the financial aspect. The races are in 30+ different locations, and now five different countries and three continents. Greg has raced in all locations except Lisbon. Reportedly, that’s on the list for 2018. 100 races seems to be frighteningly common though. Before we started racing, we didn’t know many people who did more than a couple of races a year. Now it seems we know more people who’ve done 100 races than people who have NOT. Chicago in July can be a bit muggy, but this year was surprisingly nice with temperatures for the 5K and Half starting in the mid-60’s. There were some apps we had that were forecasting thunderstorms on Sunday morning, but they never materialized. This year we had the honor of celebrating another milestone – the 50th anniversary year of Katherine Switzer’s historic run of the Boston Marathon. She was the first woman to run Boston, back when race directors were worried that running 26.2 miles would make a woman’s uterus fall out. She had to register as “K. V. Switzer”, like she always signs her name. But the initials masked her gender. We spent a few hours at the Expo as usual. The redesigned Hall of Fame medal was finally revealed at the Rock n Roll booth. The first chance to pick one up will be in Virginia Beach. We also picked up a few items for Drew. He couldn’t make the trip, but he was on our minds. In addition to the special edition racks for the Chicago locals, Pete and Marcey at SportHooks had something that crossed the miles with the just the right sentiment. The new course was a double out and back with some time in the park and some on the water. Katherine kicked off the weekend with a word about 261 Fearless, her organization that promotes women’s empowerment through fitness. She’s 70 years old and can still clock in the low 2 hours for a half marathon. One at the start. One at the finish. We’ve done this so many times, it’s a lot more fun taking pictures of my friends than of the course. We were just a few dozen meters behind Katherine and her 261 Fearless group as she added yet another chapter to her inspiring career. On the way home, we took a quick detour. Tamara and Al still hadn’t added the tyranitaur to their Pokemon Go inventory and there just so happened to be a raid a block off the path back to the hotel. Mission accomplished! Also, Beth and Jim in classic gypsy fashion, just happened upon us on the way back to their hotel, just in time for a group selfie. After lunch, we caught the opening weekend showing of Spiderman Homecoming. 2017 has been a great year to take some time off our feet for race weekend movies! We had a good light dinner at Filini’s. I’m definitely marking that place down for a return trip! The cool evening weather was a rare treat. Tawni, Al, Susan and I took a late night stroll out to the Navy Pier fireworks display. The place was packed. Note to tourists. Be careful if you sit on the grass. The sprinklers went on in two different patches. Here’s the abbreviated version, in case you went to bed early and missed it. Tawni was live streaming it and SOME people who should have been asleep started a comment war :). The pre-race meeting at gear check was a well orchestrated surprise for Greg. Champagne shots flowed. Ainsley and Amy produced a few dozen custom shirts in Greg’s signature neon yellow color. The big reveal went over well. Quick pre-race pic for our missing gypsy. Kamika went off to his usual start line position. Greg usually starts in corral 3 and finishes in the 1:30 – 1:40 range for the half. Since he wanted to see people on the course, he decided to start with his brother in dead last and see people as he passed them during the race. This way a few of his friends could make it to the finish line to hold the tape and take pictures. Starting that far back must have been driving him crazy. The course hasn’t changed much in the 8 years we’ve done it. We cross a few tricky bridges, pass the Chicago theater sign, pass 7 streets named after presidents take that right on Michigan for the three-mile straightaway, take the cheer tunnel hairpin on Martin Luther King Jr. and head back under the McCormick Center. Support was pretty good this year. The water stations were fully stocked, the sponges and cooling station between mile 10.5 and 11 probably didn’t have as many customers as they might have if it were hotter. I was working on some technique tips I picked up at the USATF outdoor championships and came within a few minutes of my Chicago PR. Susan has been running more consistently with a goal of putting up a sub-2:30 to let her move up one more corral for Disney Superheroes in November. She beat that mark with time to spare. And Greg? He got his 100th Rock n Roll finish line. Apparently, he was going so fast that they missed him the first time around but Amy and Ann did a reenactment. After that many races and thousands of miles, what’s another dozen meters to get it right? It’s been 50 years since that milestone at Boston. It’s been nearly 10 years since Greg’s first Rock n Roll to his 100th. The more I keep coming back to these events, the more I know that it’s all a matter of passion. Keep working. Keep showing up. Keep finding something that inspires and motivates you and you’ll reach your next goal. Rock n Roll Chicago is in its 8th year. There were 14,985 finishers in 2017 (9.834 in the half, 2,207 in the 10K and 2,944 in the Remix 5K), down from last year’s total of 16,531. This is the 8th year in a row we’ve done the race, most of any RNR. Missing that inaugural year is really bumming me out now. The course remains one of my favorite urban half marathons, even with the Midwest summer weather. It winds through a mix of classic old downtown, and is well supported. Short of 2016’s thunderstorms, we haven’t had any issues with weather for this location. Greg Heilers has at least 250 lifetime races at all distances. Including the Remix distances, 137 of those are under the Rock n Roll brand, putting him third in that category. He also sits at 1888 total Rock n Roll miles (3rd) and has the most miles run in a single year (550.5 in 2016). He is also raising money for the Chicago Marathon as part of the team representing the Ronald McDonald House Charities of Chicago. In some races, Transamerica sponsors a “Tomorrow Chaser” that starts last and the company donates a dollar for every person the chaser passes during the race. Transamerica doesn’t sponser this location and while Greg didn’t actually ask for donations, I decided to pledge a penny per pass based on his finish position. If you’re interested in helping him reach his $1000 goal, be sure to visit his website here. Year 10 for RNR Chicago is next year. Once the 2018 Tour Pass goes on sale, we’ll be signed up for sure.